US: Solemn preparations were underway Sunday for America’s national farewell to George H.W. Bush, whose casket was flown from Texas to Washington aboard President Donald Trump’s Presidential aircraft (Air Force One) to lie in state at the start of a days-long state homage. The 41st President died Friday, aged 94, at his home in Texas -- “a very gentle and peaceful passing,” his lifelong friend and advisor James Baker said Sunday on ABC’s “This Week.” To commemorate the first former president to die since Gerald Ford in 2006, officials have announced a detailed, four-day schedule of celebratory services and tribute, organized with military precision by the Pentagon task force charged with protecting the US capital. Its culmination will be a state funeral at Washington National Cathedral on Wednesday, which President Donald Trump -- who had often clashed with the more staid and centrist Bush family -- has declared a national day of mourning. 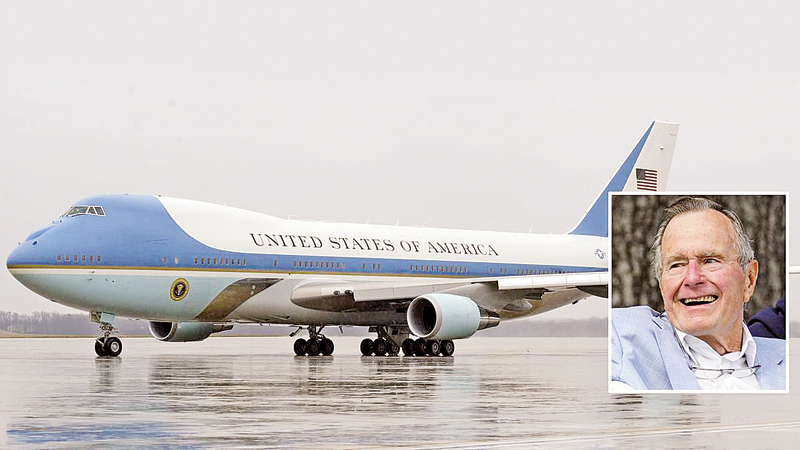 The week’s events begin yesterday, when Bush’s remains are to be flown aboard Air Force One -- made available at Trump’s direction -- from Houston to Joint Base Andrews, Maryland. Bush spokesman Jim McGrath said the Presidential aircraft’s flights to carry the 41st American President are being dubbed “Special Air Mission 41,” as he announced the plane’s arrival in Houston. “A beautiful day In Texas -- ‘ceiling and visibility unlimited,’ Mr. President,” he wrote, in reference to the aviation code phrase for a desirable situation, one used by Bush’s family and friends to spread the news of his death. Bush is lying in state in the Rotunda of the US Capitol from Monday evening to Wednesday morning, under the watchful gaze of an around-the-clock honors guard. The casket will then be transported to the cathedral for the funeral service -- the fourth there of a former President. Trump has said he and wife Melania will attend. Dozens of foreign leaders and US luminaries are expected. Former Canadian Prime Minister Brian Mulroney told Politico he will deliver one of several eulogies at the service, at Bush’s request. Former US First Lady Michelle Obama said she was canceling book tour visits to Paris and Berlin to attend the “important” funeral and honour Bush’s “tremendous contributions to our world.” The casket will then be flown back on the Presidential plane to Houston, where the former President will lie in repose at St Martin’s Episcopal Church -- where the Bushes worshiped for decades -- until a funeral service on Thursday. The remains will then be transported by train for interment on the grounds of the George Bush Presidential Library in College Station, Texas. Bush will be buried next to his wife Barbara, who died in April, and their daughter Robin, who died of leukemia aged three. James Baker, who served as Bush as Secretary of State, joined others in paying warm tribute on Sunday television talk shows. Baker called him “far and away the best one-term President we have ever had,” alluding to Bush’s single biggest political failure -- his loss in the 1992 election to then-governor Bill Clinton. Baker was a young lawyer in Houston grieving his wife’s untimely death when Bush, his tennis partner, persuaded him to try something new: help Bush run for office. That partnership eventually took Baker to a career as Secretary of State and Secretary of the Treasury -- and Bush to the White House. Baker saw his friend several times in his final days. The former President had struggled for years with Parkinson’s disease, which left him wheelchair-bound and often hospitalized -- including after Barbara’s death. After each time “he would bounce back,” Baker said on ABC.